We believe in outdoor play at Watch Me Grow! Many of us remember all the fun and adventurous things we did outdoors as kids. We may even remember our parent demanding that we “go outside and play!” Depending on the mood they were in, this was either a suggestion or an order. But, sadly, these memories may not exist for children of recent generations. According to research (Clements, 2004; Hofferth and Curtin, 2006) children today spend less time outdoors than any previous generation. And the negative effects of this inactivity are increasingly serious. The percentage of children who are overweight has increased from 5.8% in 1971 to 18.4% in 2009. Part of that increase can be attributed to the reduced number of hours spent outdoors in active play. 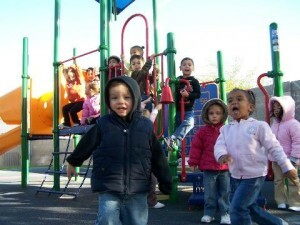 While the negative effects of a lack of outdoor play on children are known. What is less frequently discussed are the benefits of outdoor play on the development of children intellectual, physically and emotionally. The Benefits of Outdoor play on the health of children is not just associated with a decreased likelihood of being overweight. There are some other benefits that are not talked about as much but are certainly important. According to a study published in the Journal of Optemetry and Vision Science, children who play outdoors benefited from better distance vision than children who spend most of their time indoors. Another study by the American Academy of Pediatrics reported that many children are suffering from vitamin D deficiencies. Vitamin D is created by the body when it is exposed to sunlight. If the body does not get enough sunlight, a Vitamin D deficiency can take hold. Outdoor play allows children to be in the sun, which will provide them with the vitamin D they need to avoid bone and other health problems in the future. The physical and intellectual benefits of outdoor play on children of all ages has been well documented and even policy makers and educators are beginning to understand that play is just as important are the three R’s. At Watch Me Grow Child Development Center, we believe in the health and cognitive benefits of outdoor play. Our caring and professional staff will make sure that your child is safe while they play outdoors. Watch Me Grow Child Development center offers programs from infant to before and after school programs for school age children. Come check out our great programs and contact us today! We look forward to hearing from you!